A Wedgwood, dark blue jasper dip, trumpet shaped, bough pot and lid. This piece is marked 'WEDGWOOD MADE IN ENGLAND' to the base and it dates from c.1920. It also has an impresed number '8', which relates to the size, and the letter 'B'. It is decorated with a continuous band of classical figures and trees. 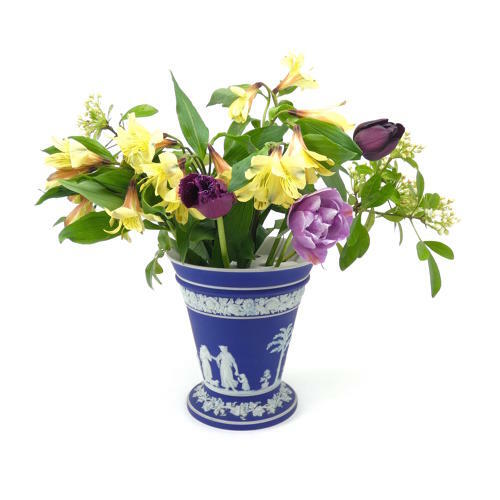 To the top of the vase is a border of flowers and to the foot is a border of grapes and vines. All of the reliefs are good quality and the jasper dip is a very good, rich, shade of blue. The vase is complete with its' lid which is in the form of a flat pierced disc for supporting the boughs of flowers. This is why they were called 'Bough Pots'. There is slight staining, to the interior, from use, but the piece is in excellent condition and it is a good, useful size.